In the previous articles of this series, we described the structure of the SQL Server tables and indexes, the main concepts that are used to describe the index and the basics and guidelines that are used to design the proper index. In this article, we will go through the operations that can be performed on the SQL Server indexes. Before creating an index, it is better to follow the index design guidelines and best practices that are described in the previous article, to determine the columns that will participate in the index, the type of the created index, the suitable index options, such as the FillFactor or Sort in TempDB, and the storage location of that index. The CREATE INDEX T-SQL syntax below is used as a template to create a new SQL Server index. The absence of the UNIQUE option will not force the uniqueness of the index key values. In the unique index, no two rows are permitted to have the same index key value. If the type of the index is not specified in the CREATE INDEX T-SQL statement, a Non-Clustered index will be created. SQL Server indexes can be also created indirectly by defining the PRIMARY KEY and the UNIQUE constraint within the CREATE TABLE or ALTER TABLE statements. SQL Server will create a unique clustered index to enforce the PRIMARY KEY constraint unless you already define a clustered index on that table. Recall that we cannot create more one clustered index on each table. A unique non-clustered index will be created automatically to enforce the UNIQUE constraint. You should be granted CONTROL or ALTER permission on the table in order to be able to can create an index. Creating new indexes on large tables should be planned carefully, due to the performance impact of this process in a production environment. You need plan carefully starting with the clustered index creation, after that you can create the Non-clustered indexes over it. Also, setting the ONLINE option to ON when you create the index will enable other data retrieving or modification processes on the underlying table to continue, preventing the index creation process from locking the table. On the other hand, the ONLINE index creation process will take longer time than the offline default index creation process. Using the SORT_IN_TEMPDB option can also help in reducing the time required to create the index, taking into consideration that the tempdb is hosted on a separate disk drive than the user database. SQL Server allows us to create up to one clustered index, 999 non-clustered indexes, 249 XML indexes, 249 Spatial indexes on each table. You can add up to 16 key columns per index, with maximum allowed size for index key record equal to 900 bytes. It is not allowed to add columns with image, ntext, text, varchar(max), nvarchar(max), varbinary(max), and xml datatypes to the index key. The number, record size and datatypes limitation of index key columns can be avoided by including Non-Key columns in the index, as we will see in details in the Designing Effective Non-clustered Index article. When you disable a SQL Server index, the definition, statistics and the data of that index will not be removed from the system catalog, but you will not be able to access that index. Disabling the Non-clustered index will prevent you from accessing that index only. On the other hand, disabling the clustered index will prevent you from accessing the underlying table’s data, until you drop or rebuild the index. You may decide to disable an index temporarily for many purposes, such as troubleshooting a specific scenario, correcting a disk I/O error before rebuilding the index, or eliminating the temporary disk space required to store the old and new version of the index during the index rebuild process, where only 20 percent if the index size will be required for sorting the index data. The SQL Server Engine disables database indexes that may contain an expression, database object or collation that could be changed or may conflict with a change in the upgrade process, automatically when an upgrade process to a new release or Service Pack for SQL Server is performed, and rebuilds it automatically once the upgrade process is completed successfully. It is better to follow a standard naming convention when creating the SQL Server indexes, to understand the purpose of that index from the index name. You can specify the type of the index, the name of the table on which the index is created and the name of the columns that participate in that index, in the index name to make it meaningful and unique at the table level. For existing indexes, you can replace the current index name with a new name that follows your company naming convention policy. Renaming the index will not affect the index structure or rebuild it, it will just change the name of that index. For example, when you create a PRIMARY KEY or UNIQUE constraints, SQL Server will create a related index automatically to enforce that constraint, providing a long name that contains the type of that constraint, the table name and a unique GUID value as shown in the previous example. As describe the SQL Server index, always remember that it is a double-edged sword that can negatively affect system performance in cases when the index is badly designed. If it is found that an index is badly designed, or it is no longer needed, you will need to drop that index from the database table and reclaim the disk space consumed by the index to be used by another database objects. Dropping the table or view will also drop all indexes created on that database object. Dropping the clustered index will take extra time and temporary disk space. This is due to the fact that, all the data stored in the leaf level of the clustered index will be stored in an unordered heap table. In addition, all Non-clustered indexes will be rebuilt to replace the clustered index keys with row pointers to the heap table. You can also perform an online drop for the clustered index, with the ability to override the default database MAXDOP value for the current clustered index drop query only. In this case, other user queries that use the underlying table will not be blocked by the DROP INDEX operation. PAD_INDEX: Used to apply the free space percentage specified by FillFactor to the index intermediate level pages during index creation. FILLFACTOR: Used to set the percentage of free space that the SQL Server Engine will leave in the leaf level of each index page during the index creation. FillFactor should be an integer value from 0 to 100, with 0 or 100 is the default value, in which the pages will be filled completely during the index creation. SORT_IN_TEMPDB: Specifies whether the intermediate sort results, generated during index creation, will be stored in tempdb. IGNORE_DUP_KEY: Specifies if an error message will be shown when duplicate key values are inserted into the unique index. STATISTICS_NORECOMPUTE: Determines if the outdated index distribution statistics will be recomputed automatically. DROP_EXISTING: Specifies that the named existing index will be dropped and recreated again. ONLINE: Specifies whether the underlying tables are accessible for queries and data modification during the index operation. ALLOW_ROW_LOCKS: Determines whether row locks are allowed to access the index data. ALLOW_PAGE_LOCKS: Determines whether page locks are allowed to access the index data. MAXDOP: Used to limit the maximum number of processors used in a parallel plan execution of the index operation. DATA_COMPRESSION: Specifies the data compression level for the specified index, partition number, or range of partitions, with NONE, ROW, and PAGE values. Remember that the ALTER INDEX T-SQL statement cannot be used to change the structure or participating columns of the index, it just allows you to Rebuild, Reorganize or SET the different index options. Until this point, we show deeply most of the operations that can be performed on the SQL Server indexes. 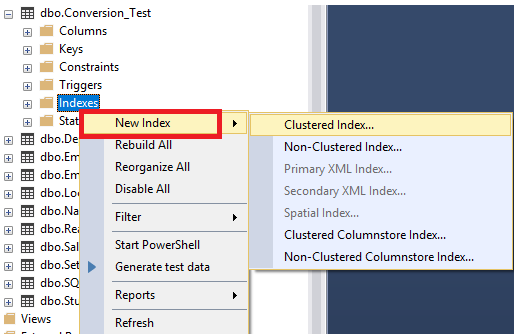 In the next articles in this series, we will describe how to design a useful and effective clustered index. Stay tuned!